(Nanowerk News) Using nanotechnology to make a book you can't read - this definitely qualifies as an entry in our "slow news Friday" section. The world’s first, nanoscale book was published as a work of fine art, April 9, 2007 by Robert Chaplin at the Nano Imaging Facility of Simon Fraser University. This book, complete with an International Standard Book Number (ISBN-978-1-894897-17-4), is entitled ‘Teeny Ted From Turnip Town’. It was written by Malcolm Douglas Chaplin and is a fable concerning the success of Teeny Ted from Turnip town and his victory in the Turnip contest at the annual county fair. It is at present the world’s smallest published book. The only catch — you’ll need a scanning electron microscope to read it. At 0.07 mm X 0.10 mm, Teeny Ted from Turnip Town is a tinier read than the two smallest books currently cited by the Guinness Book of World Records: the New Testament of the King James Bible (5 X 5 mm, produced by MIT in 2001) and Chekhov’s Chameleon (0.9 X 0.9 mm, Palkovic, 2002). The production of the nanoscale book was carried out at SFU by publisher Robert Chaplin, with the help of SFU scientists Li Yang and Karen Kavanagh. The work involved using a focused-gallium-ion beam and one of a number of electron microscopes available in SFU’s nano imaging facility. With a minimum diameter of seven nanometers (a nanometer is about 10 atoms in size) the beam was programmed to carve the space surrounding each letter of the book. The book was typeset in block letters with a resolution of 40 nanometers, and is made up of 30 microtablets, each carved on a polished piece of single crystalline silicon. 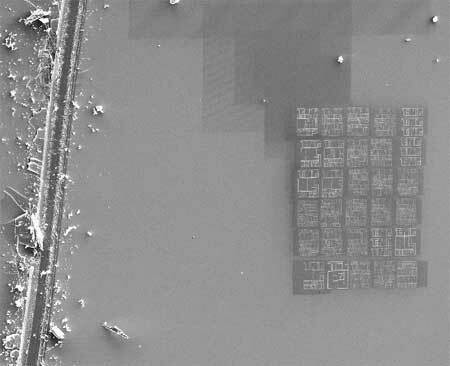 The entire collection of microtablets is contained within an area of 69 x 97 microns square with an average size of tablet being 11 x 15 microns square. The book is made up of 30 microtablets, each carved on a polished piece of single crystalline silicon. The story, written by Chaplin’s brother Malcolm Douglas Chaplin, is a fable about Teeny Ted’s victory in the turnip contest at the annual county fair. Considered an intricate work of contemporary art, the book is available in a signature edition (100 copies) from the publisher, through the SFU lab.